Fillers & Botox® - Luis A. Cenedese, M.D., F.A.C.S. 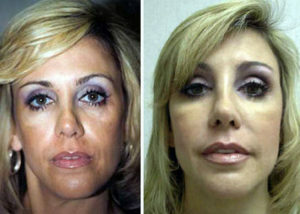 Restylane, Juvederm, Radiesse and Botox are very popular and becoming more so. Dysport a new muscle relaxing agent, released a few months ago is proving to be reliable, safe and as effective as Botox. For treating forehead, central brow grimacing and crow’s feet around the eyes these Botulinum Toxin agents have become the mainstay of treatment. Botox has become the most popular muscle relaxer, on average lasting 3-4 months. It was originally approved by the F.D.A. to treat eyelid muscle spasm, and now approval has been extended to the area between the eyebrows. Forehead and eyelid wrinkles are improved by Botox injections in these areas. We have expanded applications to raise the outer eyebrows and the corners of the mouth. Chin furrows, “smoker’s” upper lip lines and jowls can be improved with Botox or Dysport injections. Patients are not usually satisfied with the duration of improvement and changes in the smile when used to diminish lip lines/wrinkles. Side effects, usually lasting one to two days, occur in 1% to 2% or treatments typically subside without any treatment. Occasional bruising most often seen around the eyelids is easily covered with camouflage leg and body cover. Please schedule a consultation to discuss any of these issues further. Facial Fillers: With increased technology, chemists have developed longer lasting hyaluronic acid injectables. Restylane, Perlane and Juvederm are appropriate for medium depth lines around the mouth, eyelids, cheeks and to fill the lips. Smokers fine lip lines can be smoothed out as well as the corners of the mouth. This will turn up the corners to diminish a sad, drooping appearance. Radiesse, similar to Hydroxyapetite, the major constituent of bony tissues, can correct the smile lines from the mouth to the nose, the chin and between the brows, for over one year when combined with Botox in these areas. These products are relatively allergy free. Immediate results are noted with mild swelling which subsides overnight. Occasional bruising can be camouflaged with leg and body cover cream. You will look better that same evening. We have expanded the use of Radiesse and Sculptra to build up the hollows below the eyelids, cheek bones, jawline, temples and outer brows. Careful injection into the eyelids will lift the brows, fill out the lids and prevent the need for skin excision in mild cases of lid skin excess. This enlargement will last up to two years. Always keep in mind that an additional filling session at one to four months may be necessary to maintain long term results. These fillers stimulate your own collagen production improve the quality and appearance of the skin. This effect begins a month after injection and lasts up to two years. Please check with our staff one week in advance to ensure we have your choice available. Platelet Rich Plasma: Over the last few years concentration of one’s platelets drawn from your own blood and centrifuged has been resulting in rejuvenation of the skin. By stimulating collagen synthesis wrinkles and color (pigmentation) irregularities are nicely improved with three monthly treatments. Permanent Fillers: This appealing group of procedures can give a permanent correction to the deeper folds surrounding the nose, mouth, lips, and between the brows. Cheek bones, the chin as well as the outer upper brow/eyelid can be augmented. Several different implant options are available including grafting of skin from an existing scar, facelift, eyelid or tummy tuck, otherwise discarded skin. Autologous tissue grafting(fat) continues to render the most long lasting natural appearing results. Silicone, Polymethylmethacrylate, Latex, Gortex and Alloderm have been used successfully to yield permanent correction of these areas, albeit with higher complication rates and occasional palpability. Bellafill a semi-permanent filler is an excellent choice for those seeking longterm correction of laugh lines, hollows below the eyelids and creases around the corners of the mouth. We can inject this gel to enhance the nose as well as augment the cheek bones, eyebrows and the jawline. Careful consideration of long term changes in facial anatomy must be made in planning the location and amount of correction. Conservative correction with follow up sessions are suggested. Through experience I have come to believe that facial skin care should include a Retinoic acid night cream to build collagen and reduce wrinkles, a Vitamin C cream for its antioxidant benefits and a good moisturizer/sunscreen. There is no cream no matter what the price which I have found to be more effective than these. Many of my patients suffer from hyper-pigmented (dark areas) skin conditions which will improve with a skin bleacher. Resistant dark pigmented areas (eg. below the lids) and scars can be lightened with Chemical Peels, Laser or Intense Pulsed Light treatments. For these reasons we offer to our patients the following: Retinoic Acid Rejuvenating Vitamin A Cream .025% and .05%. This exfoliating collagen inducer when applied nightly reduces fine lines by building new collagen and evens out discolorations. LUX- C Vitamin C and E Antioxidant Facial Serum. With two of the most effective antioxidants daily use prevents age and environmental damage to the skin.